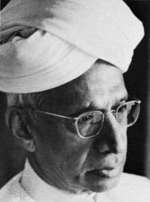 India celebrates this day as 'Teacher's Day', honouring Dr S Radhakrishnan, former President of india and a great Scholar! One still thinks of Freddie Mercury as a young man, who was considered a god among singers, ever since 'Bohemian Rhapsody' hit the airwaves! Freddie was a Singer, Composer, Lyricist, Record Producer, Pianist, Guitarist and a designer. He had an amazing range of 5-6 octave or more, ranging from a bass to a soprano, the average being three for a singer � and he had this ability to glide from one end to the other effortlessly, without having even the slightest strain on his voice!The flamboyant music legend was an inspiration to many, and still is, even after his death. I remember the first time I heard 'Bohemian Rhapsody'('Bo Rhap') and I still find it an enigma! Freddie and his band 'Queen' gave us many more inimitable songs, each one better than the previous, or vice versa. Farookh Bulsaara, 'Freddie' to his friends and family, was the 'First Parsee Rock Star from India' � perhaps it is the least known fact about one of the most talented artists of all times, whose untimely demise on 24 November 1991 at 45 years shattered the whole world. Some of us cried when it happened; many shocked and numb with grief, while a sense of emptiness engulfed most his ardent fans -- World lost one of its brightest stars and Bomi and Jer lost their beloved son. His voice has that magic, which makes the listener even to stop breathing while listening to his songs and the electric aura has not changed even after years of listening and it would remain so for eternity! 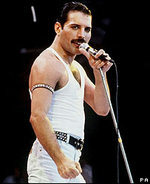 Freddie took a diploma from the Ealing College of Art and it was not long before he ventured into rock music, quite different from the choir music he practised at St. Peters, his old public school in Poona! Freddie was the driving force behind the formation of the group 'Queen', with the three other quite distinct individuals, Brian May, Roger Taylor and John Deacon. Of course it was not the first time Freddie was part of a band � 'The Hectics' was the name of the band he and his friends formed at St Peter's! 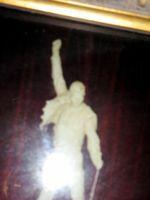 While waiting for Queen�s debut single, 'Under Pressure', Freddie released �I Can Hear Music� under the pseudonym 'Larry Lurex', which is a collector�s item now! The fantastic voyage started with �Keep Yourself Alive� in April 1973, spanning over 20 years to record �Days of Our Lives� in 1991. And �Bohemian Rhapsody� happened to the music world in 1975! This operatic rock explosion bombarded the airwaves for weeks, which brought stardom to Queen and the 'King of Rockdom' was born! 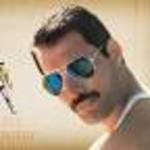 �Bo Rhap� was the first ever single to be re-released and get to number one again, remaining there for five weeks! 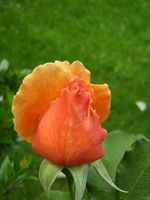 The words of 'Bo Rhap', written by Freddie Mercury, are so melancholic for all times � the inner turmoil, love for his mother and saying good-bye all those years ago in 1975, perhaps was in anticipation of what was ahead, and poignant even now! It stayed at the 'Number One Spot' in the UK's 'Top of the Pops chart' for nine weeks in 1975 and five weeks in 1991 -- it had ballad, opera, guitar solo, hard rock and an exceptional video presentation! The video of 'These Are the Days of Our Lives", was released in the UK in December 1991 after his death, which brought tears to everyone's eyes! It was the 8th track in their album, 'Innuendo' released in May 1991. 'Crazy Little Thing Called Love', 'Who Wants to Live Forever', 'Another One Bites the Dust', 'A Kind of Magic', 'Innuendo', 'Pain is Close to Pleasure', 'These are the Days of Our Lives� , and many more, will never lose their magic! The song that breaks everyone's heart while watching the film, 'Highlander' is ''Who wants to live Forever' in Freddie's heart-wrenching voice, and who wouldn't wish to have it played during one's last minutes on this planet -- I would! Freddie made two solo albums, all the songs written by him, 'Mr Bad Guy', with 11 songs and 'Barcelona' with eight songs, including 'La Japonaise, which he wrote in Japanese -� 'Mr Bad Guy' was dedicated to his cat 'Jerry' and all the 'Cat lovers in the World'! He also made many singles, including 'The Great Pretender', and released singles from his solo albums, three singles from each album, 'Mr Bad Guy' and 'Barcelona', both staying in the charts -- the operatic 'Barcelona' with the famous Opera Singer Montserrat Caballe, 'Mr Bad Guy', 'The Great Pretender', 'Made in Heaven', 'Love Me Like There's No Tomorrow', 'I Was Born To Love You', 'There Must Be More to Life Than This', 'Made in Heaven', 'In My Defence', and many more! But the band 'Queen' made music together till Freddie died on 24 November 1991. Live Aid concert at Wembley Stadium in 1985, provided the world stage for Freddie, and now, 30 years later, one still feels the electric vibes of those 'Twenty minutes' when he and his band, Queen were on stage and Freddie had the whole world in the palm of his hands, by the sheer power of his music and personality -- 175,000 people were clapping with him for his 'Radio Ga Ga'! It was twenty minutes of pure magic from the King of Rock that became legendary and it has been named the 'World's Greatest Rock Gig' in an industry poll, beating Jimmy Hendrix's 'Woodstock-1969'! The tribute concert for Freddie at Wembley stadium in April 1992 turned out to be more than just a tribute and it proved beyond any doubt that his music was inimitable. Perhaps the only voice that has the power to excel that of Freddie is the most beautiful voice of Yesudas, the greatest Carnatic Classical and light music legend! Even a mere comparison to Yesudas, will be the highest tribute to Freddie yet, as Yesudas has this powerful voice with a phenomenal range, that reaches beyond sound barriers � words dance when they both put feeling and depth into each word! Freddie and Yesudas belong to the same elite club, 'Two Members only Club', as only they have such celestial quality of bringing magic, range and depth even to the most mundane words! 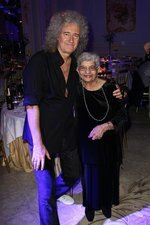 Let's join his Mother, Jer and sister Kashmira to celebrate Freddie's life and his Music! On this Day, more than any other day, I also wish to honour my Parents, all my Teachers and all those whom I admire and value for their books, articles and advice! :"These Are The Days Of Our Lives": this makes me cry every time. Freddie was ill when this song was recorded. 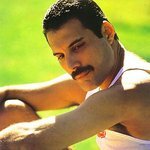 This was the last video recording by Freddie and I am sure he knew it was time to say goodbye, and he did it by saying, "...I still love you..." : "These Are The Days Of Our Lives", which was from the album 'Innuendo' released in 1991, but this song was released in the US as a single on his 45th Birthday, 5 September 1991, but it was released in the UK only in December 1991, but by then, he had bid his farewell on 24 November: https://www.youtube.com/watch?v=mRwG5LoSvwQ -- very poignant, and I remember the tears when I watched this on television, and it still makes me cry! May you Rest in Peace Freddie, and we still love you! : 'Who wants to live Forever': the song that breaks everyone's heart while watching the film, 'Highlander' is, ''Who wants to live Forever' in Freddie's heart-wrenching voice, and who wouldn't wish to have it played during one's last minutes on this planet -- I would! This was written for the film 'Highlander, included in the album, 'A Kind of Magic' , released in 1986, and this song was released as a single. (https://www.youtube.com/watch?v=ZEZYm7s-54Q: this version is for the film, but there is another Official video by Queen. 'Highlander' stars Sean Connery and Christopher Lambert and one gets to hear Sean Connery's voice at the beginning of the video and that starts it rather well! Touch my world...with your fingertips. The Official version from the Album: https://www.youtube.com/watch?v=N6mO8aWay0U.